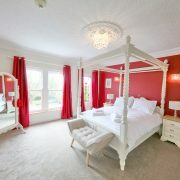 Being an old manor house, each of the bedrooms at Llwyn Country House is unique, with its own special character and charm. They are individually decorated and styled to make the most of the House’s original features, which can sometimes be surprising. Who would expect a fireplace in an en-suite bathroom? When you have a sleepover at our House, we want you to feel like you’re in a home away from home. Relax and sleep soundly in our extremely comfortable beds with their Egyptian cotton bedding and plump pillows. Chill out wrapped in our softly sumptuous towels, reading or watching the in-room TV. Connect through our wifi to keep in touch with the world or check out things to do in the area. And if there’s anything you need from us which would make your stay more comfortable, all you need to do is ask. 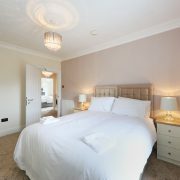 Each bedroom has a name, chosen to link to the theme of love, warmth and caring, the feelings we want to create when you’re staying with us. If you’re not a Welsh speaker, then it’s a chance for you to pick up a little bit of the language. Four of our rooms are en-suite, while Cwsg has a separate bathroom. Looking for that fireplace in the en-suite? Then ask to stay in ‘Cariad’ and that’s exactly what you’ll find. 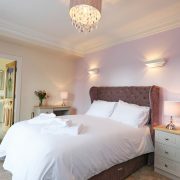 So that you can see the individual character and layout of our bedrooms, we’ve put some images and more information on each one, which you can view by clicking on the bedroom links (below). Please be aware that because all of our rooms are upstairs, we are unable to offer overnight accommodation to visitors in wheelchairs or with severely restricted mobility. 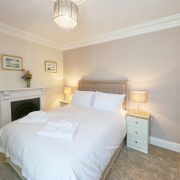 When the main house is full and we have guests who don’t mind a short walk or drive, we can offer extra rooms in Han y Bont Cottage. The cottage is just a 5 minute walk or 1 minute drive away and offers a unique atmosphere of its own. The downstairs, with its stripped wooden floors, includes a lounge and dining room with baby grand piano and a feature stained glass panel on a coal mining theme. Guests can cater from themselves if they prefer as the downstairs also has a kitchen and separate breakfast area. Currently, the cottage has 2 double rooms with en-suite bathrooms, 1 single en-suite on the first floor and 1 double en-suite attic room. Guest parking is at the rear of Han y Bont Cottage. 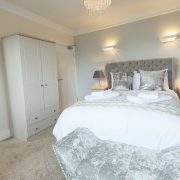 Guests can take just one room or can take the whole of the cottage.